If you’ve ever spent a summer pulling weeds out of your backyard, you know that you have to pull out the entire weed‚ from the roots, or else it’s bound to come back. Similarly, when a problem occurs within your company, the issue is bound to continue if you don’t identify and eliminate its cause. Figuring out what disrupts production and taking steps to correct the problem is the basis of any root cause analysis. 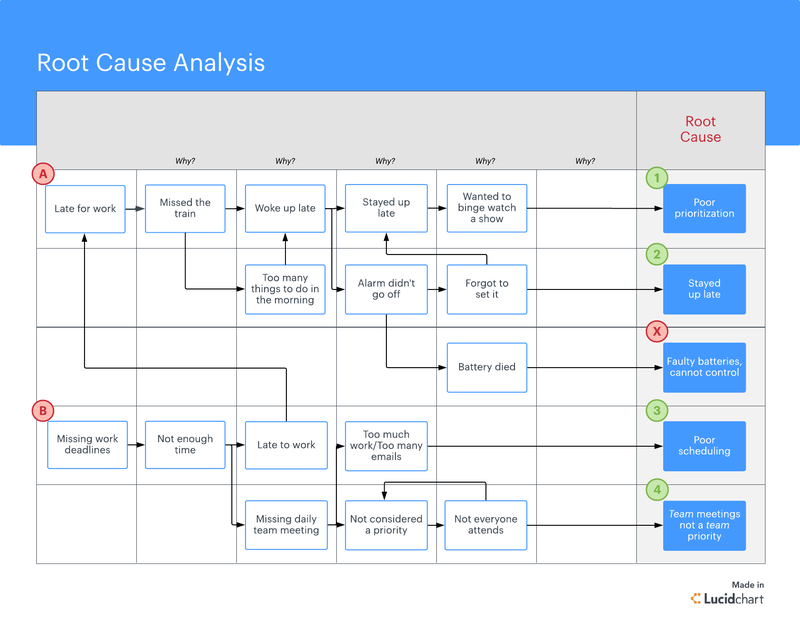 And if you’ve never performed root cause analysis before, you’re in luck—we’ll walk you through the benefits and different methods you can use. Root cause analysis refers to any problem-solving method used to trace an issue back to its origin. You’ll discover what happened, how it happened, why it happened, and what steps are needed to prevent similar issues. Similar to removing weeds from a garden, a root cause analysis isolates and removes the source of a problem. This root cause analysis flowchart demonstrates how to examine an issue. Click the template below to start your own analysis in Lucidchart. Inefficient processes waste time, money, and other resources. Temporary fixes only mask the problem or delay the effects until later. Using a root cause analysis, organizations identify the source of a problem and implement permanent and lasting solutions to prevent future issues. Ready to get started? Follow these steps to perform root cause analysis and resolve any problem at your company. Clearly identify what you see as problematic events and list out the specific symptoms of the issues. The first step in the root cause analysis process is understanding the problem or problems your organization faces. How long have these issues been going on? What are the signs of proof of these problems or issues? What type of impact has the issued caused? Are the impacts measurable, i.e. loss of time, productivity, inventory, etc.? Go directly to the source to collect the most accurate data. Involve everyone who has been impacted by the issue in the data collection phase to gain as much insight as possible. Was there a series or sequence of events that led to the problem or allowed the problem to occur? Are there additional problems that stem from this? Try one of these methods to identify possible causal factors. Also known as a fishbone diagram, a cause-and-effect diagram helps you examine potential causes by category. For example, manufacturing industries label the diagram branches with the six M’s (machines, methods, materials, measurements, Mother Nature, manpower) and think of causal factors within each category. These diagrams encourage you to explore all possible causes of a problem instead of stopping at the most obvious conclusion. This method encourages you to keep going deeper as you examine an issue. Ask “Why?” at least five times until you’ve reached the catalyst. Check out our 5 Whys template to begin your own analysis. Similar to the 5 Whys, this technique asks users to break complex problems down into smaller, detailed parts. Write down the main problem, and next to it, write down factors contributing to the problem or questions that the problem raises. Repeat the process to drill down to the root cause. A tree diagram lays out the actions or events that led to the failure or problem. Look over your list of potential causal factors, and determine the real reason this problem or issue occurred in the first place. Dig deep to examine each level of cause and effect and the events that led to the unfavorable outcomes. Ask yourself what you can do to prevent the issue from occurring again. What solutions are necessary? Who will be responsible for the solution and its implementation? Are there any risks associated with implementing the chosen solution? Rely on the information you gathered through your cause-and-effect diagram to identify what changes need to be made. Use an impact analysis to understand the positive and negative consequences of your solution. Root cause analysis can be used to assess potential future risk or an incident that has already occurred. 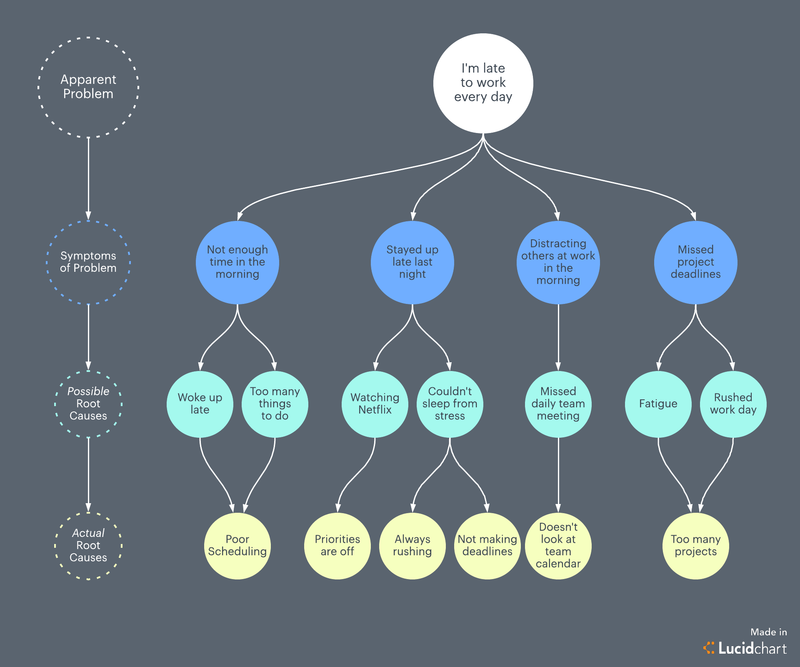 Lucidchart can help you dissect and identify symptoms of a problem, actual root causes, and possible solutions.